New CEB Executive Committee elected in Belgrade, Serbia on February the 4th, 2017. In a letter sent to all National Federations of Europe on Wednesday the 2nd, February 2017, Czech Baseball Association President Petr DITRICH announced that he is not running for the position of CEB President anymore but for the position of CEB 1st vice-president only instead. Petr DITRICH is now endorsing Didier SEMINET for President of the Confederation of European Baseball. Running candidates for the position of President now are current President Jan ESSELMAN and French Baseball & Softball Federation President Didier SEMINET. The Elections are being held in Beograd, Serbia, on Saturday the 4th of February. Full letter of the Czech Baseball Association. By a letter sent to all National Federations on Wednesday, February the 2nd, 2017, Austrian Baseball Federation President Rainer HUSTY endorsed the candidacy of Didier SEMINET for the position of CEB President. The elections for the new Executive Committee are being held on Saturday the 4th, 2017 in Beograd (Serbia) during the CEB Congress. Rainer HUSTY is running for the position of 3rd vice-president of the Confederation of European Baseball. Full letter of the Austrian Baseball Federation. The French Baseball & Softball Federation was holding its General Assembly on Saturday 28th, 2017 in Paris. More than 125 clubs participated to the elections that saw current President Didier SEMINET being reelected for four more years with an approval rate of 96%. Mister-Baseball released on January 27th, 2017 an interview of the three candidates for the position of President of CEB. Please find below the interview of Didier SEMINET. Mister-Baseball.com: Please introduce yourself to the audience for Mister-Baseball.com? Didier Seminet: My name is Didier Seminet. 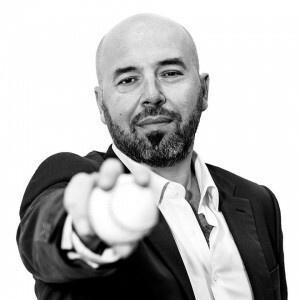 I’m the President of the French Baseball & Softball Federation since 2010 and co-founder and President of the Association Francophone de Baseball et Softball since 2014. I’ve been involved in Baseball & Softball for a long time, first as a player then as a leader or various baseball/softball organizations. I am 50 years old, have one daughter and am leading a company specialized in safety coordination. Mister-Baseball.com: What qualifies you to become President of the Confederation of European Baseball (CEB)? Didier Seminet: I think I have the leadership that is needed for the future of European Baseball & Softball. Under my presidency the French Baseball & Softball Federation has thrived, growing from 8,500 to 12,675 players while its budget rose from 850k€ to 1,4M€. I guess the figures speak for themselves. Mister-Baseball.com: If you’re getting elected, what will be your program for the first year in office? Didier Seminet: I think that the first step is to work on combining of the Confederation of European Baseball and the European Softball Federation and get to know every National Federation to understand their needs. Mister-Baseball.com: Internationally with the World Baseball Softball Confederation (WBSC) and in Europe as well with the majority of the federations, baseball and softball will be governed under one umbrella. There have been talks between CEB and the European Softball Federation (ESF) about a merger for some time. Would you be interested in bringing CEB and ESF together? If yes, what would be the advantages and what will be your measurements to make this happen? Mister-Baseball.com: The Euro League Baseball (ELB) was established last year to bring professional baseball to Europe. However, it was done without sanctioning of CEB. Will you be talking to the organizers to bring the ELB into CEB? Is a real professional league a possibility? Didier Seminet: A professional league is a possibility for European Baseball. This is something that needs to be discussed within the new CEB board first but I’m willing to discuss opportunities and options with EBL stakeholders. Mister-Baseball.com: What will be your steps during your term to increase the number of baseball players in Europe? Didier Seminet: We need to work on the development of National Federations through a funding programme as well as on growing the interest of fans, media and sponsors through great and marketable events. Mister-Baseball.com: What would be on your agenda to increase the visibility of European baseball competitions? Didier Seminet: I think that video recording and broadcasting of our flagships events is a start to increase fan, media and sponsors interest. We need to spend time, energy and resources on promotion which is a key issue of the development of the game in Europe. Mister-Baseball.com: The CEB offices are currently in Zagreb, Croatia. Will they stay there or do you propose a change? Didier Seminet: There is no plan to move the office. Mister-Baseball.com: In the past CEB has asked to submit applications for a full-time executive position. Will you be in favor of hiring employees to run the day to day side of CEB? Didier Seminet: CEB already has Kristina who is working part-time for the Croatian Baseball Federation and part-time for day-to-day activities of European Baseball. As of now CEB doesn’t have the financial resources to hire a full-time executive position. CEB needs employees but that would not be wise to hire personal if the funding is not secured. Some National Federations – FFBS is one of them – are ready to offer some of their staff to work for CEB. Their work would create an income for CEB (sponsorships, tv rights, development funds, etc.) that would then offer the possibility to hire part-time or full-time jobs. It is difficult for European countries, except maybe The Netherlands and Italy, to compete on the international stage against top nations such as Japan or The United States. The World Baseball Softball Confederation then came with a brilliant concept: Team Europe. The idea was to assemble a team to allow for the best players to compete against Japan in Tokyo to promote the return of baseball/softball to the 2020 Olympics, as well as for young talents to get competitive games in the Asia Winter Baseball League. This experience was very successful, Europe playing against Japan multiple times in 2015 and 2016 in Tokyo in front of sell-out crowds. But more than offering players and coaches a great opportunity to compete at high level and improve their skills, Team Europe offers our continent a tremendous asset that helps bring National Federations together and promote European Baseball worldwide. Unity, something that can only help National Federations grow the game of baseball in Europe. We need to reinforce and our commitment and support where ever possible and agreed on the Team Europe concept, deploy a strategy to use the potential of this asset to help grow baseball in Europe. Competition is at the heart of CEB and National Federations everyday work. An European cup is to any club player what an European Championship is to any national team player: the reason why he is training for, the titles he wants to win, the memory that will last from it. It’s also what fans are waiting for: an opportunity to root for their favorite team or nation and share their passion with friends and family. Having the opportunity to watch it through video recording and TV or web-broadcasting is more than important, but you first need interesting events to attract fans, media and sponsors. What European Baseball needs is competitions that offer great, competitive games with intensity and uncertainty. We believe that some changes to the actual format of both CEB clubs and national teams competitions are needed in order to rise the interest of players, fans, media and sponsors. That’s what a Premier 6 could bring for instance. Imagine a tournament that gathers both the Top 6 nations of Baseball and Softball for an unique event once every two year, when the European Championship is not being played. 2 disciplines, the 12 best teams of Europe, only 1 location, an event that would offer a great sporting show to both baseball & softball fans and strengthen the ties between our two sporting disciplines.